Strong mental health is fundamental to the well-being of individuals, families and communities alike. Mental health is defined as "a state of well-being in which every individual realizes his or her own potential, can cope with the normal stresses of life, can work productively and fruitfully, and is able to make a contribution to her or his community". Poor mental health has been identified as one of the largest causes of disability, poor quality of life and reduced productivity among adults. The correlations between poor mental health and an increased prevalence of chronic and preventable diseases, musculoskeletal conditions and multi-regional pain emphasizes the need for an effective and holistic multidisciplinary approach to the management of this condition. Through a multidisciplinary approach, physiotherapists can address the physical well-being of individuals with mental health conditions from across their lifespan. Improvements to physical well-being can improve mental well-being and prevent the development of mental health conditions, such as depression which are often associated with other physiological conditions. As physiotherapists working within these dimensions, there is a need to evaluate clinical outcomes, receive feedback and engender new approaches. Outcome measures play a key role in achieving these feats. There are several mental health outcome measures in use and there are ongoing projects for the development of more. Below you will find mental health outcome measures that can be used by physiotherapists in clinical practice. An outcome measure in mental health care can be defined as a tool used to measure the effect on a person’s mental health as a result of health care intervention, plus any additional extra-therapeutic influences. Specifically, outcome measures are quantitative indicators used at two or more points in time: baseline, post intervention, discharge, or follow-ups. To be useful, mental health outcome measures must be valid and reliable, sensitive to change, comparable across relevant client groups and service types, and meaningful to both clients and clinicians. Furthermore, outcome measures need to be meaningful to clients and relevant to the areas in which they have treatment goals. Research with mental health service consumers shows that many measures are not particularly relevant to their situations and do not capture outcomes that are personally meaningful. Determining an outcome measure that is applicable in both clinical work and service evaluation is challenging. Mental health is a broad construct that comprises a number of different measurement domains. These include measures that cover recovery, cognitive performance and emotional experience, quality of life, ability to undertake daily activities and maintain interpersonal relationships consistent with development stage, and general life satisfaction and wellbeing. The Physiotherapist is concerned about these measures and would work in improving and assessing them. Health of the Nation Outcomes Scales (HoNOS)as developed during the early 90s by the Royal College of Psychiatrists as a measure of the health and social functioning of people with severe mental illness. The scales contain 12 items measuring behaviour, impairment, symptoms and social functioning. The scales are completed after routine clinical assessments in any setting. The GAF is a clinician-rated scale giving a measure of overall psychiatric disturbance integrating three dimensions of functioning: psychological, social and occupational. It is a single-item measure on a 100-point scale divided into 10-point intervals. It has shown good construct and concurrent validity, but questions have been raised over its content validity. Inter-rater reliability can be low, particularly in routine clinical use. It is sensitive to change when correlated with change in the Positive and Negative Syndrome Scale (PANSS). The GAF is brief, easy to use and reliability can be increased with minimal training, which makes it more acceptable in routine clinical settings. DIALOG is an outcomes measure to support structured conversation between patients and clinician focusing on the patients’ views of quality of life, needs for care and treatment satisfaction. How satisfied are you with your mental health? How satisfied are you with your physical health? How satisfied are you with your job situation? How satisfied are you with your accommodation? How satisfied are you with your leisure activities? How satisfied are you with your friendships? How satisfied are you with your partner/family? How satisfied are you with your personal safety? How satisfied are you with your medication? How satisfied are you with the practical help you receive? How satisfied are you with consultations with mental health professionals? 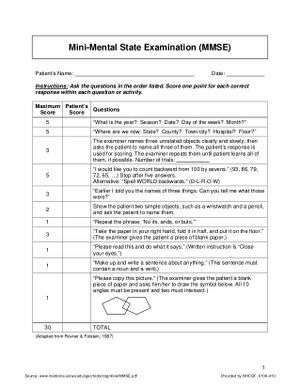 MMSE is a tool that can be used to systematically and thoroughly assess mental status. It is an 11-question measure that tests five areas of cognitive function: orientation, registration, attention and calculation, recall, and language. The maximum score is 30. A score of 23 or lower is indicative of cognitive impairment. The MMSE takes only 5-10 minutes to administer and is therefore practical to use repeatedly and routinely. The MMSE is effective as a screening tool for cognitive impairment with older, community dwelling, hospitalized and institutionalized adults. Assessment of an older adult’s cognitive function is best achieved when it is done routinely, systematically and thoroughly. Since its creation in 1975, the MMSE has been validated and extensively used in both clinical practice and research. The MMSE is effective as a screening instrument to separate patients with cognitive impairment from those without it. In addition, when used repeatedly the instrument is able to measure changes in cognitive status that may benefit from intervention. However, the tool is not able to diagnose the case for changes in cognitive function and should not replace a complete clinical assessment of mental status. ↑ Department of Health and Ageing (2008). National Mental Health Policy. Department of Health and Ageing, Canberra. ↑ World Health Organization. Mental health: a state of well-being 2014. ↑ Gureje, O., Ademola, A. & Olley, B. O. (2008) Depression and Disability: Comparisons with Common Physical Conditions in the Ibadan Study of Aging. Journal of the American Geriatrics Society 56: 2033-38. ↑ Australian Institute of Health and Welfare (2010) When Musculoskeletal Conditions and Mental Disorders Occur Together. Cat. No. AUS 129. Canberra: AIHW. ↑ Slade M. What outcomes to measure in routine mental health services, and how to assess them: a systematic review. Aust N Z J Psychiatry. 2002;36(6): 743–53. ↑ Batty MJ, Moldavsky M, Foroushani PS, Pass S, Marriott M, Sayal K, et al. Implementing routine outcome measures in child and adolescent mental health services: from present to future practice. Child Adolesc Mental Health. 2013;18(2):82–7. doi:10.1111/j.1475-3588.2012.00658.x. ↑ Crawford MJ, Robotham D, Thana L, Patterson S, Weaver T, Barber R et al. Selecting outcome measures in mental health: the views of service users. Journal of Mental Health. 2011;20(4):336–46. doi:doi:10.3109/09638237.2011. 577114. ↑ Wolpert M. Uses and Abuses of Patient Reported Outcome Measures (PROMs): Potential Iatrogenic Impact of PROMs Implementation and How It Can Be Mitigated. Adm Policy Ment Health. 2014;41(2):141–5. doi:10.1007/ s10488-013-0509-1. ↑ Wolpert M, Cheng H, Deighton J. Measurement Issues: Review of four patient reported outcome measures: SDQ, RCADS, C/ORS and GBO– their strengths and limitations for clinical use and service evaluation. Child Adolesc Mental Health. 2015;20(1):63–70. doi:10.1111/camh. 12065. ↑ Australia AMHOaCNaCMH. National Community Managed Organisation (CMO) Outcome Measurement Project: Final Report to the Mental Health Information Strategy Standing Committee 1.1. Sydney, NSW2013. ↑ 13.0 13.1 13.2 Fossey EM, Harvey CA. A conceptual review of functioning: implications for the development of consumer outcome measures. Aust N Z J Psychiatry. 2001;35(1):91–8. doi:10.1046/j.1440-1614.2001.00846.x. ↑ Startup M, Jackson MC, Bendix S. The concurrent validity of the Global Assessment of Functioning (GAF). Br J Clin Psychol. 2002;41(4):417–22. doi:10.1348/014466502760387533. ↑ Barber CC, Neese DT, Coyne L, Fultz J, Fonagy P. The Target Symptom Rating: a brief clinical measure of acute psychiatric symptoms in children and adolescents. J Clin Child Adolesc Psychol. 2002;31(2):181–92. ↑ Priebe, S., McCabe, R., et al (2007) Structured patient–clinician communication and 1-year outcome in community mental healthcare: Cluster randomised controlled trial.